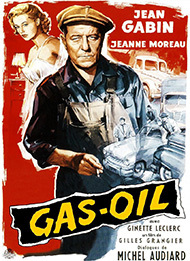 Jean Gabin as a trucker? Jeanne Moreau as his long-suffering girlfriend? Is this Gilles Grangier's version of "Bogart through the looking glass" (as critics suggested was the case for Lemmy Caution in Alphaville)? 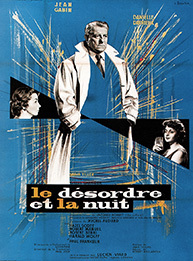 Feel free to exhale: there is no "meta" to be found here, only a taut policier that rolls down the road with the same effortless panache that Gabin brought to all of his roles. Gas-Oil is memorable for pitting Gabin's character against a pungent, relentless gangster's widow (the great Ginette Leclerc) who's convinced that Gabin is sitting on her dead husband's suitcase full of cash. With Robert Hossein, Estella Blain, Magali Noël, Jacques Dacqmine, Jane Marken, Philippe Clay. (1955, dir. Gilles Grangier, 92 min.) Screenplay: Michel Audiard and Gilles Grangier from a novel by Georges Bayle. Cinematography: Pierre Montazel. Film editing: Jacqueline Thiédot. Music: Henri Crolla. Those looking for connective tissue between late 50s French noir and Hollywood crime film motifs have come to the right place—Gilles Grangier peppers this Jean Gabin vehicle with loads of nightlife and an abundance of sensual atmosphere, including knockout jazz numbers performed by expatriate American singer Hazel Scott. 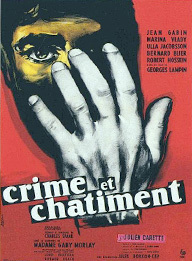 Gabin is a world-weary cop (having made the transition several years earlier in Henri Decoin's Razzia sur la chnouf) who becomes involved with a slumming young angel (Nadja Tiller) with the ironic nickname of Lucky. 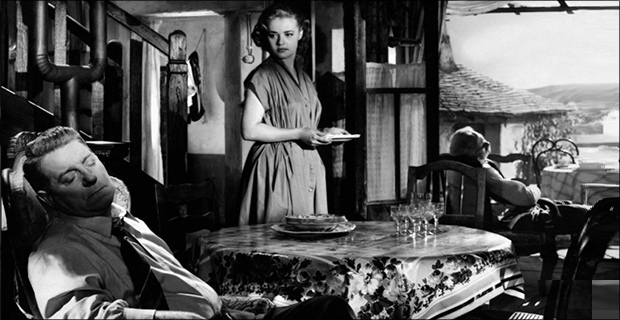 It's a love affair that is as tender as it is titillating, but Gabin gets downright ferocious as he gets closer to solving the murder of a Paris jazz club owner. With Jean Gabin, Nadja Tiller, Danielle Darrieux, Paul Frankeur, Robert Berri, Hazel Scott, Louis Ducreux, François Chaumette. (1958, dir. Gilles Grangier, 93 min.) Screenplay: Michel Audiard and Gilles Grangier from a novel by Jacques Robert. Cinematography: Louis Page. Film editing: Jacqueline Sadoul. Music: Jean Yatove. Gabin's first "out of the closet" cop role is a stunning example of his paternal star presence, as he plays the patient, methodical (and downright eloquent) Commissioner Gallet, a fine warm-up for his later success in the role of Inspector Maigret. Robert Hossein fans take note—Georges Lampin (who mentored Hossein on his first film, Les salauds vont en enfer—shown in our 2015 festival) commissioned legendary screenwriter Charles Spaak to create a loose, modern-day remake of Dostoyevsky's classic in order to showcase Hossein in the Raskolnikov-like role. Old-school to a fault (he was assistant to Marcel L'Herbier on the great silent director's first talkie, 1930's Le mystère de la chamber jaune), Lampin—Russian by birth—fashions a dark, brooding film featuring an all-star cast, with special honors going to old pros Gabin and Bernard Blier. With Jean Gabin, Robert Hossein, Bernard Blier, Lino Ventura, Marina Vlady, Ulla Jacobsson, Gérard Blain, Gaby Morlay, Gabrielle Fontan, Julien Carette. (1956, dir. Georges Lampin, 107 min.) Screenplay: Charles Spaak from the novel by Fyodor Dostoyevsky. Cinematography: Claude Renoir. Film editing: Emma Le Chanois. Music: Maurice Thiriet.